(a) Enter the "Vehicle Signal Check Mode" screen. 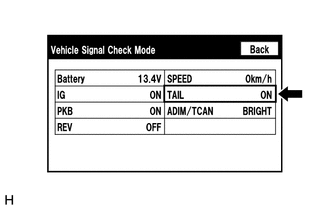 Refer to Check Vehicle Signal in Operation Check (See page ). (b) Check that the display changes between ON and OFF according to the light control switch operation. This display is updated once per second. As a result, it is normal for the display to lag behind the actual switch operation.